My mom died in the middle of the night. 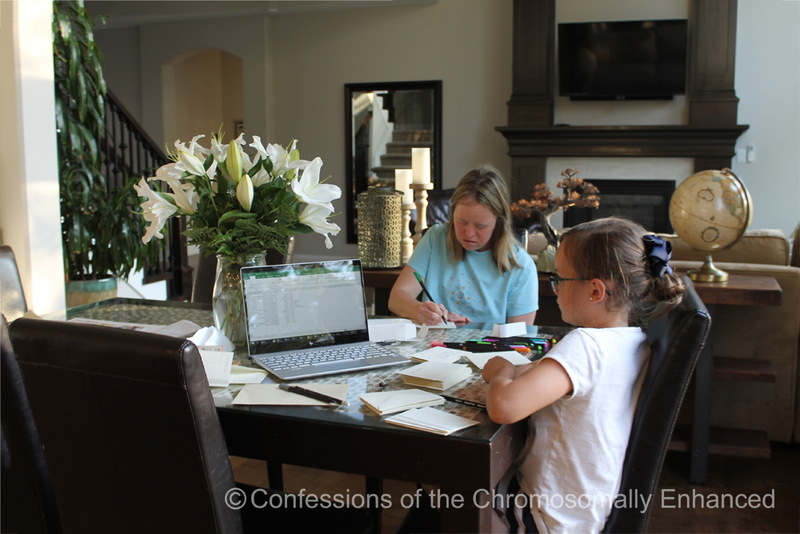 The next morning, Travis took the girls to school so I could have some time alone with Leanne to deliver the news. I took her on a walk because I didn't want a negative memory to be associated with a particular spot in my home. We started out by talking and Mom came up in the conversation quite naturally. When I told Leanne that she had died the night before, Leanne buried her face in my shoulder and cried, really hard, for about 30 seconds. Then she looked up at me and said "Elizabeth, can I ask you a question?" I said, "Of course. You can ask me anything." She said, "Can we have chili for dinner?" What in the ?!?! I let out some sort of a shocked snort and I stumbled, "Uh, yeah. Sure. I guess so." She replied, "That would make me feel better." We kept on walking and we stopped at the park and decided to swing. 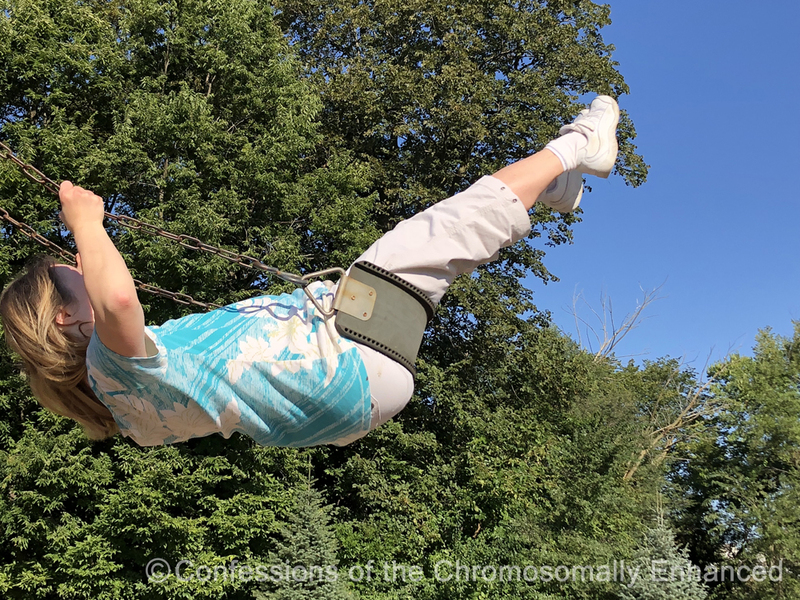 I let Leanne swing freely until she opted to stop. Then we went home. Travis returned from dropping the girls off, and found me and said "I just went to give Leanne a hug and she asked me if we could have chili for dinner" and he kind of laughed. I said, "I know. I don't get it." Later, when we were cleaning out Mama Hop's unit at the retirement community, we found one food item in the cabinet: a single can of chili. 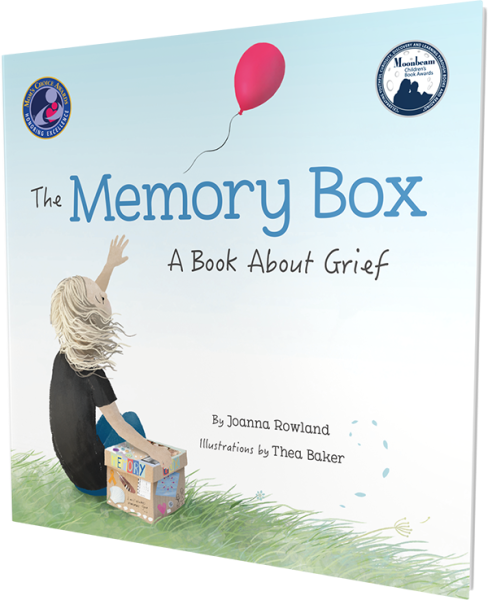 Leanne's journey through grief has been oddly serene. She rarely cries. She talks about Mom and says "She's in a better place - she's in heaven. I pray for her." Prayer is one resource Leanne turns to many times throughout the day. She is very devout; incredibly strong in her faith. 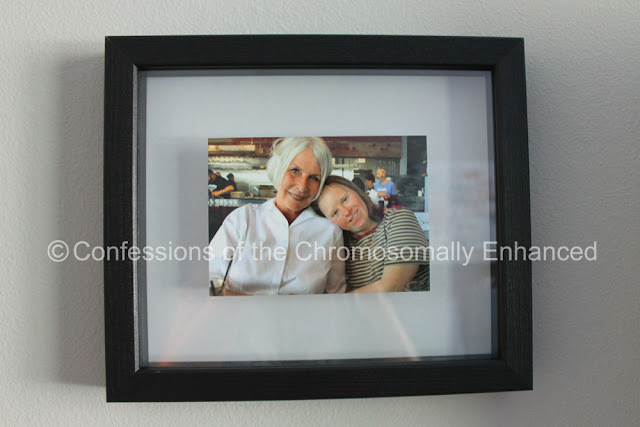 One of the first things I did upon Mama Hop's passing is to order Leanne a framed picture of her and my mom; something tangible that she could have with a smiling reminder of her happy days with mom. She immediately requested that Travis hang it in her room, right next to her TV. Every day, Leanne checks the mail. She looks forward to opening sympathy cards. 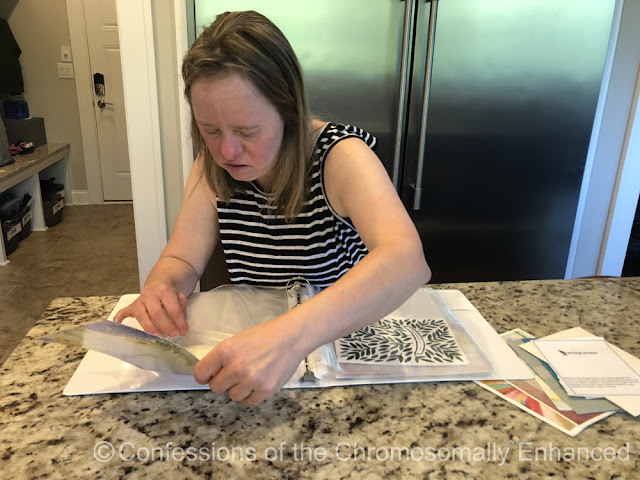 I gave her a binder with page protectors and she saves each and every card in the binder. 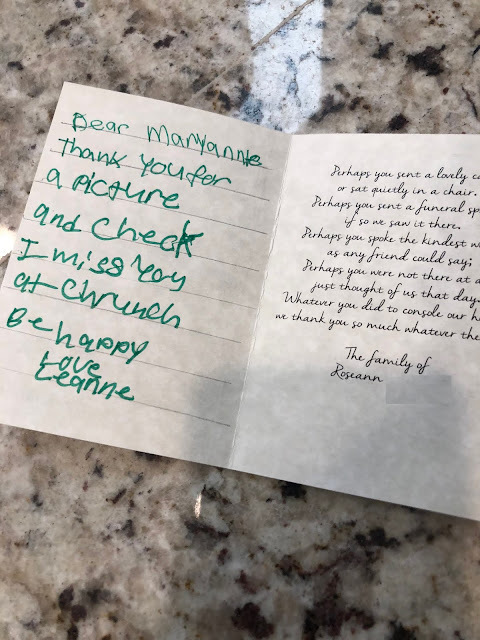 Leanne joined Merryn and I in sending thank you notes for the flowers and memorial donations. Participating in these activities does not upset Leanne at all. In fact, she seems to enjoy offering words of comfort to others. 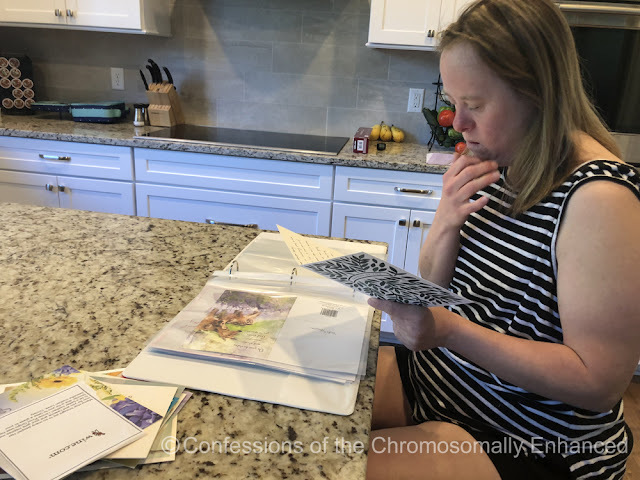 People with Down syndrome tend to be very concrete thinkers. Everything is literal; abstract concepts are hard. Leanne doesn't dwell on the past. She doesn't worry about the future. She lives in the moment. I don't force her to have conversations about Mom but I don't dodge the subject either. She tells me that she loves mom and misses her, but that mom is watching us from heaven. She talks about other people with have lost (Dad, Grandma, Grandpa, pets) and she points to the sky and says that they're up there. She knows that while we can't be with them right now, that they are still with us. She says "Mom is in my heart." 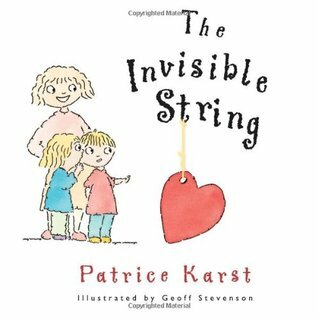 The Invisible String by Patrice Karst - This is a sweet children's book that delivers the message that even when we are separated from loved ones, we are still connected by love. 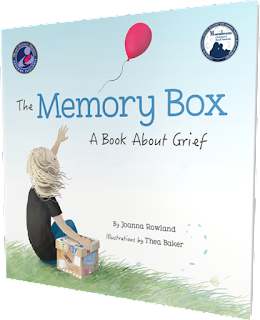 The Memory Box by Joanna Rowland - This is a book that addresses death through the eyes of a child with sensitivity and it offers ideas of how we can preserve the memory of our loved ones by keeping mementos and photos in a special place. The following document was given to me by the incredibly kind and compassionate social worker at the hospice house where my mother passed. It is a wealth of guidance. 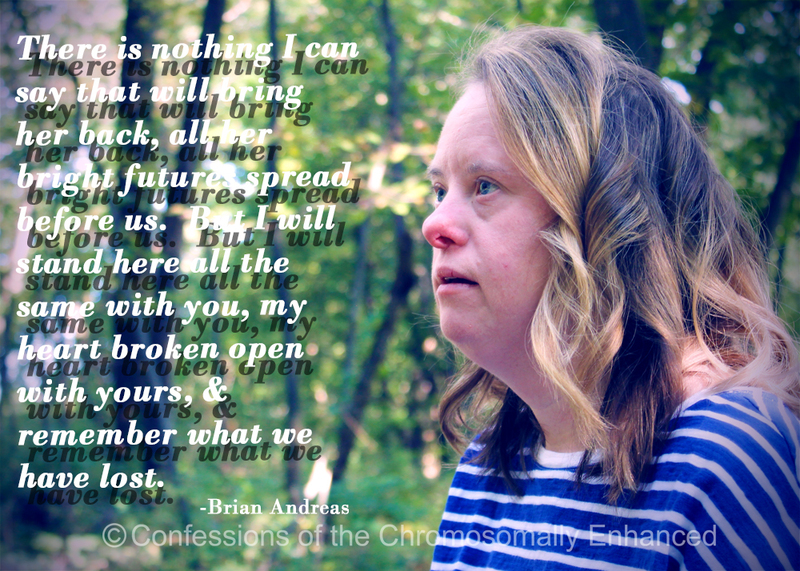 It can also be found on the "Resources" tab of the blog. I second this comment. Elizabeth, take care. Still thinking of your family & praying in Maryland. Thank you for sharing as your family walks through this difficult time. You are often in my thoughts and prayers. Leanne is a remarkable woman and it looks like she will be a great source of comfort to your family. Such a beautiful post and such a caring sister you are- Leanne is blessed to have you. It struck me that she brought up Chili for dinner... when I gave a eulogy at the funeral of a dear family member, I spoke about the intimacy of sharing a meal; food as an avenue to the soul. Keep looking for signs and symbols in that chili... Leanne, as always, spoke from the heart.